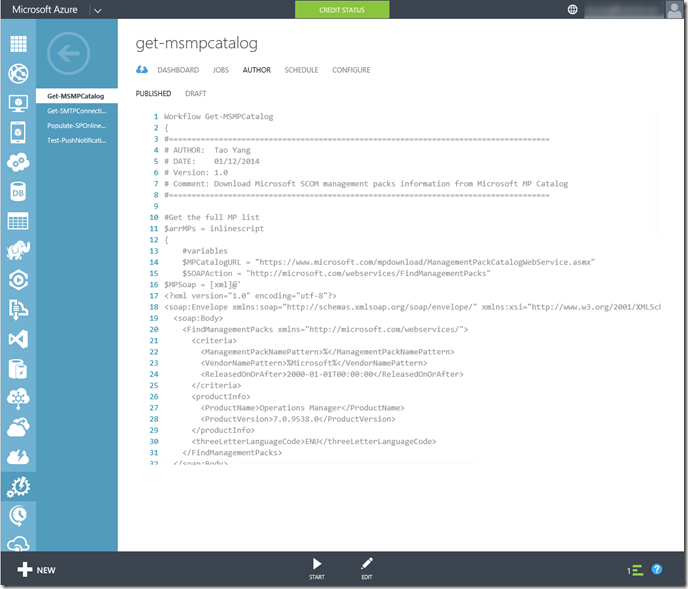 Previously, I have posted how to build your own Microsoft OpsMgr MP Catalog on SharePoint 2013 using SMA. It is a solution that you can implement on-prem in your own environment if you have existing SharePoint 2013 and SMA infrastructure in place. As I mentioned at the end of the previous post, I have also developed a solution to populate this MP catalog on a Office 365 SharePoint Online site using Azure Automation – a 100% cloud based solution. Because of the differences in APIs between on-prem SharePoint 2013 and SharePoint online, one of the runbooks is completely different than the on-prem version. 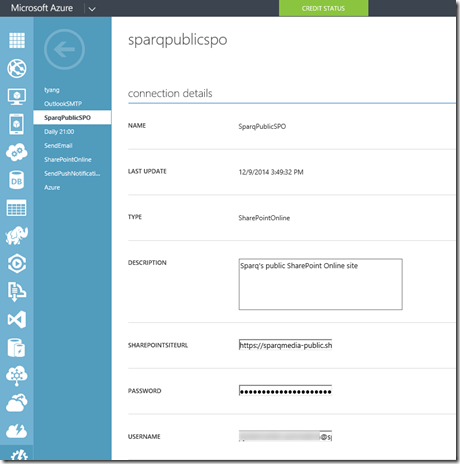 In this post, I will go through how I’ve setup the MP catalog on SharePoint Online using Azure Automation. The list creation and customization process is exactly the same as the On-Prem SharePoint 2013 version. I won’t go through this again. please refer to Step 1 and the customizing SharePoint List sections in my previous post. Again, this runbook is unchanged from the On-Prem version. 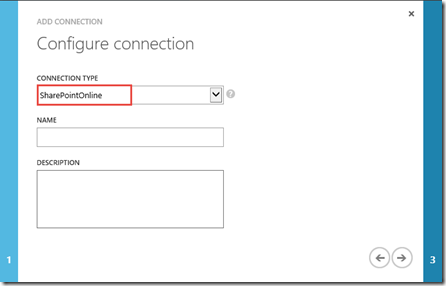 Simply import it into your Azure Automation account. In order to authenticate to SharePoint Online sites, We must use a SharePointOnlineCredentials instance in the script. 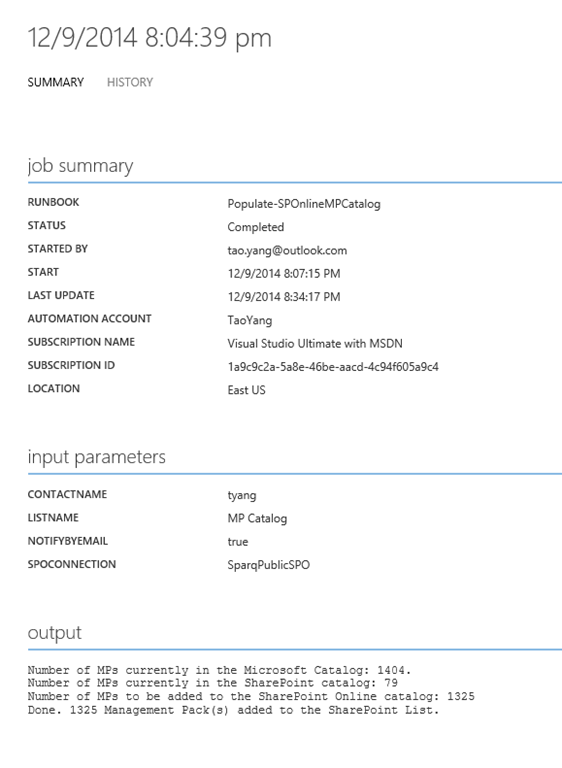 In my previously post, I wrote a runbook called Populate-OnPremMPCatalog. 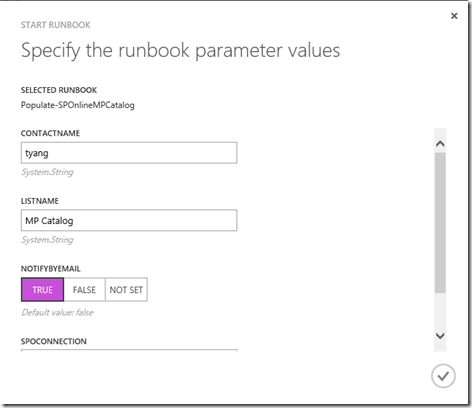 That runbook utilize Invoke-RestMethod PowerShell cmdlet to interact with SharePoint 2013’s REST API. Unfortunately, we cannot pass a SharePointOnlineCredentials object to this Cmdlet, therefore it cannot be used in this scenario. Additionally, the SharePointOnlineCredentials class comes from the SharePoint Client Component SDK. In order to create a SharePointOnlineCredentials object in PowerShell scripts, the script need to firstly load the assemblies from 2 DLLs that are part of the SDK. Because I can’t install this SDK in the Azure Automation runbook servers, I needed to figure out a way to be able to load these DLLs in my runbook. 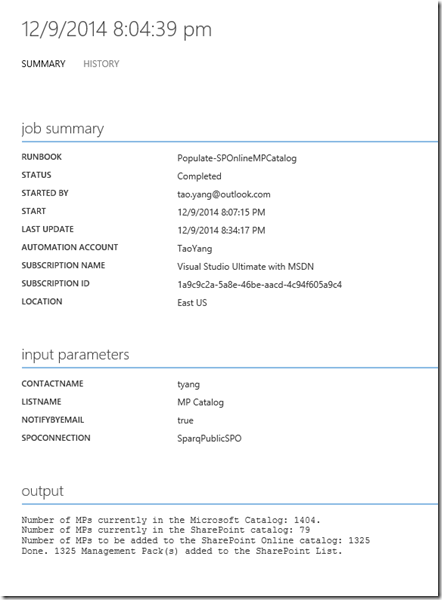 As I have previously written SMA Integration Modules with DLLs embedded in. This time, I figured I can do the same thing – Creating a PowerShell / SMA Integration module that includes the required DLLs. Therefore, I’ve created a customised module in order to load the assemblies. But since the SDK also consists of other goodies, I have written few other functions to perform CRUD (Create, Read, Update, Delete) operations on SharePoint list items. These functions have made the runbook much simpler. SharePointOnline-Automation.json – SMA Integration Module Meta File (where the connection asset is defined). The zip file you’ve downloaded from the link above DOES NOT contain the 2 DLL files. I am not sure if Microsoft is OK with 3rd party distributing their software / intellectual properties. So, just to cover myself, you will need to download the SDK (64-bit version) from Microsoft directly (https://www.microsoft.com/en-us/download/details.aspx?id=35585), install it on a 64-bit computer, and copy above mentioned 2 DLLs into the SharePointOnline module folder. Once the DLLs are placed into the folder, zip the SharePointOnline folder to SharePointOnline.zip file again, and the integration module is ready. New-SPOCredential: Create a new SharePointOnlineCredentials object from the username and password provided. This module is made to be re-used for SharePoint Online operations that involves list items. I will write a separate post to go through this in details. But for now, all we need to do is to import it into Azure Automation. 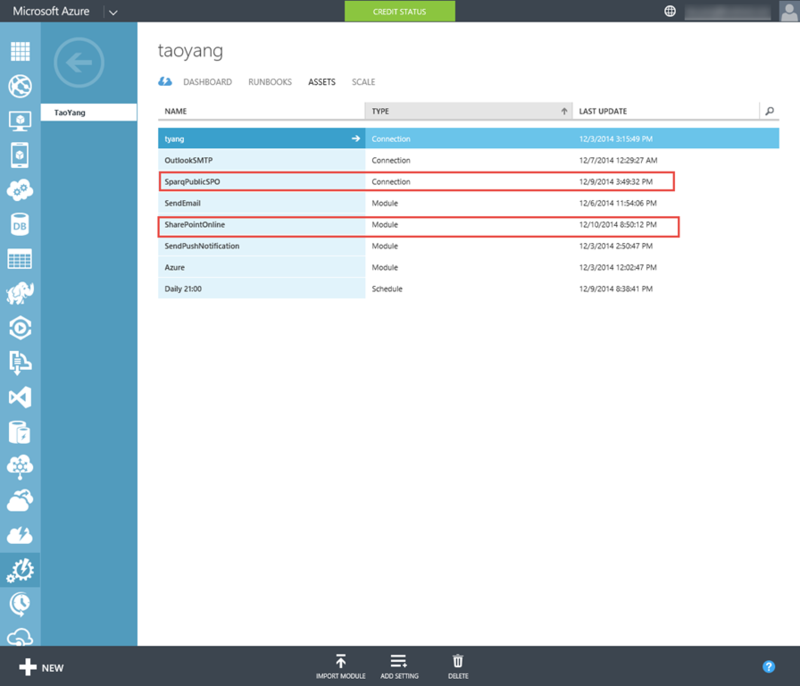 Now that the integration module is ready, it needs to be imported into your Azure Automation account. This is done via the Import Module button under Assets tab. Once the module is imported, a connection object must also be created. UserName – a User how should be part of the site members role (members group have contribute access). This username MUST be in the email address format. (i.e. yourname@yourcompany.com). I believe this account must be an account created in the Office 365 subscription. I have tried using an outlook.com account (added as a SharePoint site member), it didn’t work. Password – Password for the username you’ve specified. This is equivalent to the previous runbook Populate-OnPremMPCatalog. I have named it Populate-SPOnlineMPCatalog. 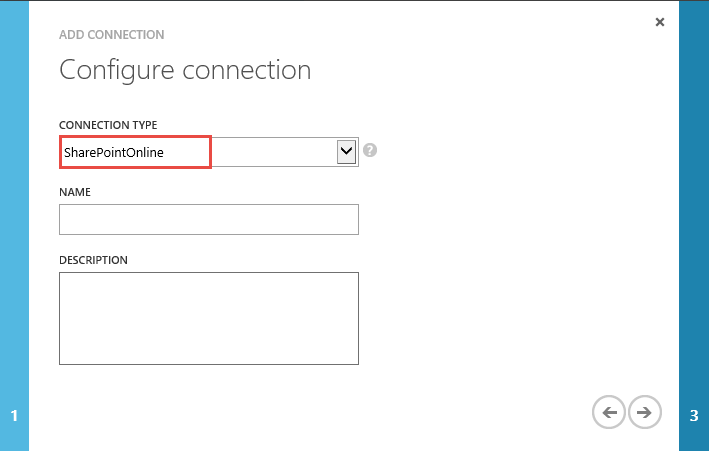 SPOConnection: The name of the SharePointOnline connection that you’ve created earlier. ListName: The list name of your MP catalog list. NotifyByEmail: Specify if you’d like an email notification when new MPs have been added to the catalog. 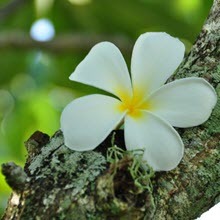 ContactName: If NotifyByEmail is set to “true”, specify the SMAAddressBook connection name for the email notification recipient. 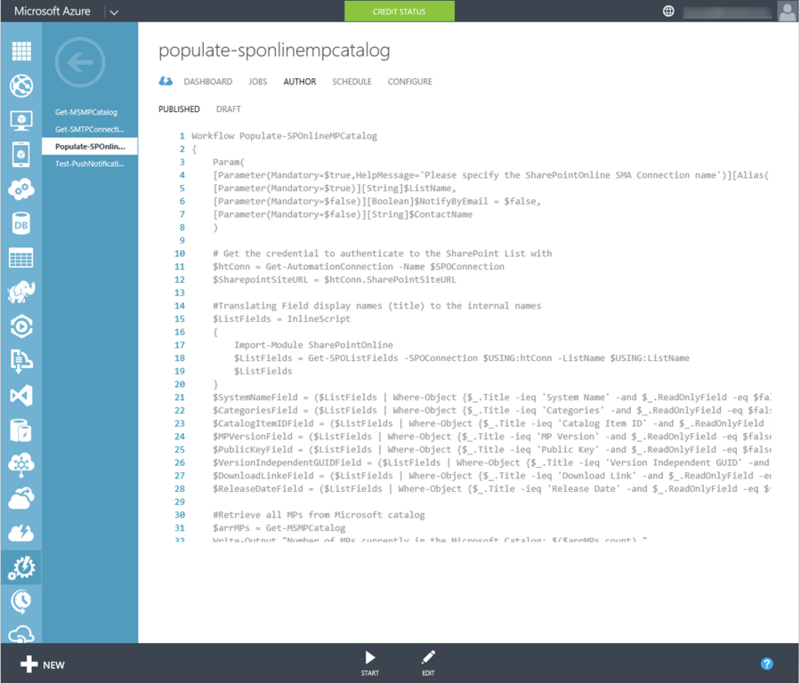 Note: I have previously blogged the issues I have experienced using the SendEmail module in Azure Automation. 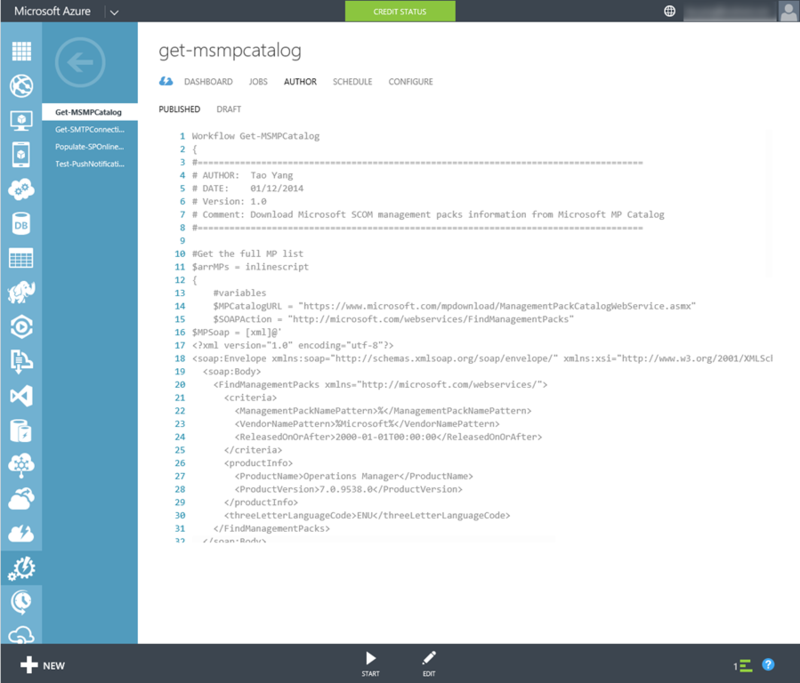 You may find this post useful: Using the SendEmail SMA Integration Module in Azure Automation. Same as the On-Prem version using SMA, you can create a schedule to run this on a regular basis to keep the catalog in sync with Microsoft. I won’t go through the schedule creation again. Currently, Azure Automation has a “Fairshare” feature, where the maximum allowed execution time for a job is 30 minutes. Fortunately, based on my multiple test runs against multiple Office 365 SharePoint online sites, the first executions of this runbook always complete JUST under 30 minutes. However, if you found your job in Azure Automation is terminated after 30 minutes, you should be able to just run it again to top up the list. But any subsequent runs should only take few minutes. To me, this post completes the circle. 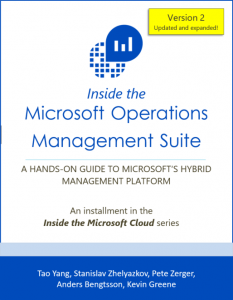 I’m happy that I am able to provide solutions for people who wants to host the catalog On-Premise (by using SharePoint 2013 and SMA), as well as who’d like to hosted in on the cloud (Office 365 and Azure Automation). 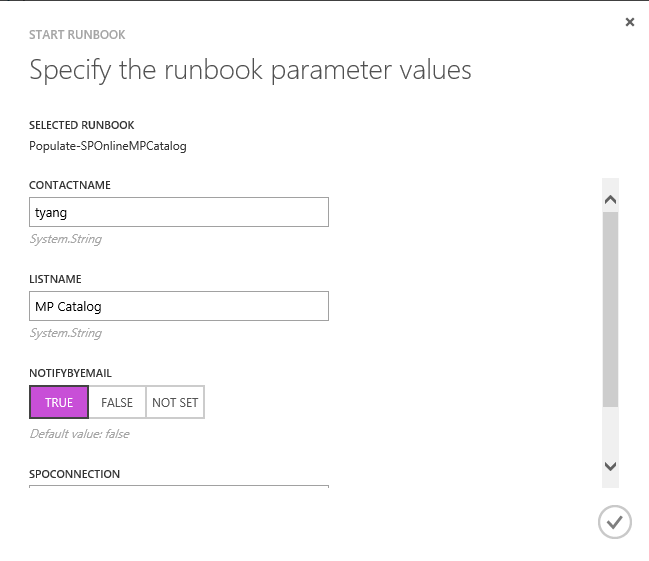 The 2 different runbooks (and the additional integration module) are 100% based on what SharePoint are you going to use. 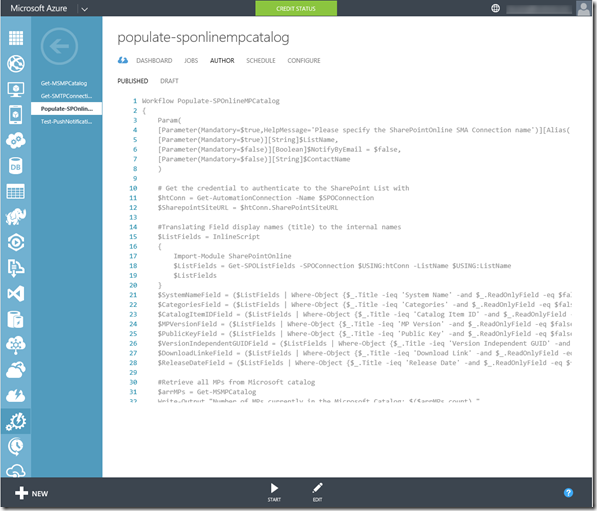 There is also a 3rd possible combination: Using SMA to populate SharePoint Online list. In this scenario, the steps are the same as what I described in this post. I have also tested in my lab. it is working as expected. 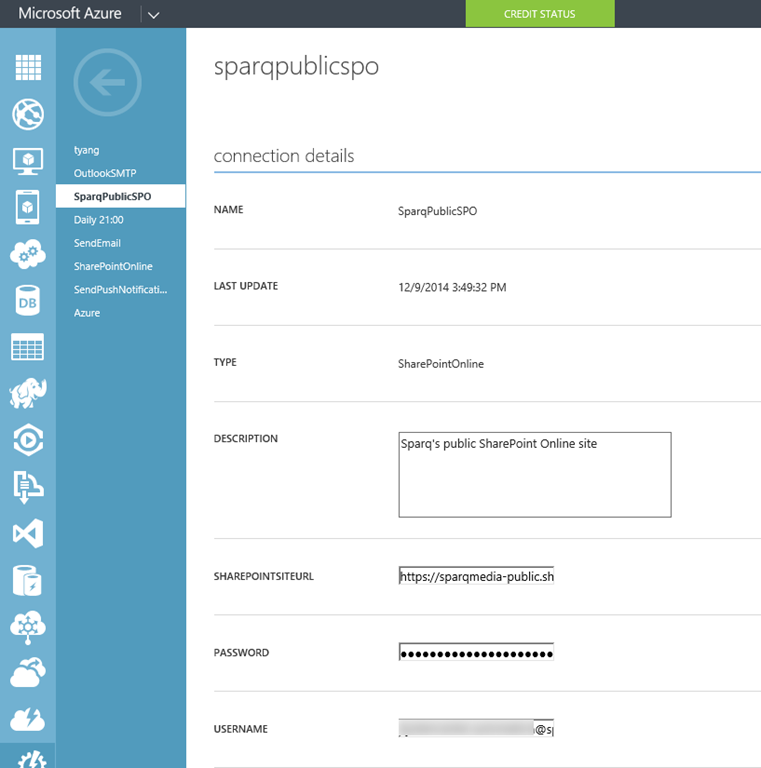 Additionally, I am also working with my fellow System Center MVP Dan Kregor to make this MP Catalog publicly available for everyone on Sparq Consulting’s public SharePoint Online site. We will make a separate announcement once it is ready. – So even if you can’t setup one up on-prem or on the cloud, we’ve got you covered . Thanks for all the System Center MVPs who have provided feedback and input into this solution. I am working o a project called Automation based on https://365lab.net/2016/01/09/create-ad-users-with-help-from-azure-automation-and-sharepoint-online/. When I enter the new user detailes in the list form and press submit my data reach the azure where they execute the powershell code. Below is the error I receive. Of course, the new user is created. Of course this means I am using your modules : http://blog.tyang.org/2014/12/10/using-azure-automation-build-microsoft-opsmgr-mp-catalog-sharepoint-online/. I keep getting this error, which I do not understand. Can you help me please? Do I have to modify anything in your modules? I have checked and the method exists both in the runbook and in the sharepoint modules. In the old version it was named Update-SPOListItem, instead of, so I have renamed it. Can you please advise me what to do next?